Stephanie Chavez first noticed the abandoned piano in Cathedral Park when she got to work Monday morning. Covered with a stained canvas dropcloth and chained to a park bench, it was painfully obvious this was no Steinway. “I don’t know what the story is,” Chavez, who works in a jewelry store across the street, said Friday. It’s not a story so much as it is an only-in-Santa Fe tale. 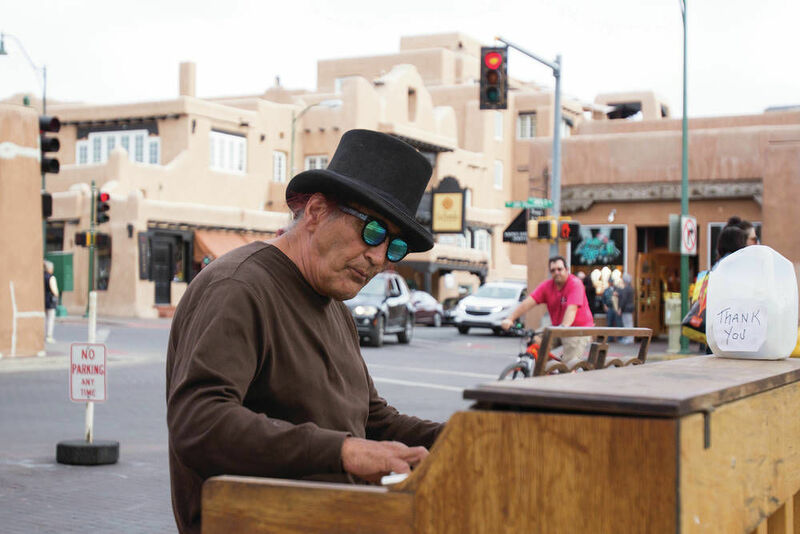 The piano is at the center of a dispute between its owner and the Santa Fe Police Department, though the discord appeared to have been amicably settled late Friday with a handshake — and the issuance of a citation. Left in the downtown park on a rickety, homemade dolly with chipped green paint and sagging tires taken from a wheelbarrow, the piano belongs to busker David Vigil, a local musician who also is an artist with a studio on Canyon Road. Though the instrument is somewhat mobile, Vigil had been leaving the piano behind overnight — first on the Plaza and later at nearby Cathedral Park. Vigil, 64, said moving the piano back and forth is difficult, so he figured he could lock it up much like people lock up their bicycles. When police told him not to leave it on the Plaza, he did so, assuming stashing it at the less-traveled Cathedral Park would be OK. So, Vigil secured the piano to a park bench with a bicycle lock. “I know it’s at my own risk, but I don’t think anyone is going to steal a piano because it weighs so much,” he said. True enough, perhaps, but police recently installed a lock of their own. “We warned him a couple of times before that he could not do that,” police spokesman Greg Gurulé said. “Oh! There’s a twist!” the grinning officer said before proceeding to help Vigil push the piano across the street toward the Plaza. Along their route, both men posed for pictures. When McDermott wasn’t looking, Vigil playfully stuck his tongue out. McDermott, often on the downtown beat, said police had received seven complaints about Vigil’s piano. “It’s a violation of the busker’s ordinance and it’s misuse of public property because the park benches are made for people to come sit,” McDermott explained. Vigil, who also plays the guitar, said he bought the piano for $120 from a local family who, he said, had left it outside for years in their wood yard on Canyon Road.“I’ve been rebuilding it and restoring it,” he said of the piano, which has at least one or two keys that don’t work. Vigil, who rolled the piano down to the Plaza from his studio on Canyon Road about a week ago, said he’ll try to find private property in the downtown area to store the piano. Ideally, he said, he would want a golf cart to pull it back and forth.